The Wrenwane manual kitchen knife sharpener pitches itself as a small, practical budget sharpener that will look good in any kitchen due to its simple aesthetic. As with most sharpeners of this type, the Wrenwane has 2 sharpening stages, 1 containing course tungsten carbide to sharpen dull knives. The other has finer ceramic abrasives for your blades that need that little touch up. The tool is only suited to knives that are sharpened on both sides of the blade, (there is no way of preventing the Wrenwane from sharpening both sides simultaneously) a fact that may put of some buyers. However, considering the target market, the sharpener does live up to what it needs to do. Being very simple to use, with customary rubber non-slip feet and a large handle, there is no chance of slipping up and wrecking the knife while in operation. And of course, everything is angle guided taking out any potential error of judgement. The Wrenwane has garnered positive user reviews in the short time it has been on sale, (the product was launched earlier this year). 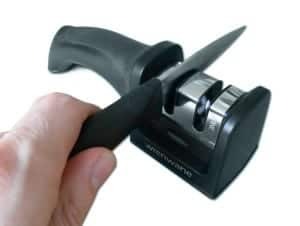 However, we did find it slightly uninspiring in that there are countless other knife sharpeners, at this price range from other well known manufacturers. To say that Wrenwane has entered a competitive market would be an understatement. In a way, we see nothing here that raises the product against that competition. However, as the under dog, it is always nice to give them a chance. In view of that fact alone, their knife sharpener is worth checking out if you can. Wrenwane is an interesting company within the kitchen tools arena in that they are very newly formed. In fact Wrenwane was trademarked in the UK and January of this year, (2014) and in the US in July. (Making them at the time of writing, only a few weeks old as far as their American presence goes). So in short, they are a company to keep an eye on. It is always interesting to see new knife sharpening products from different players in the field. We here at Sharpen-up wish them all the luck.